Yoga doesn't have to be exclusive to the studio or gym. Yoga postures combined with deep breathing can be utilized anywhere. A lot of us spend a considerable amount of time driving our cars, which can lead to achy backs, slumped shoulders, and tight leg muscles. 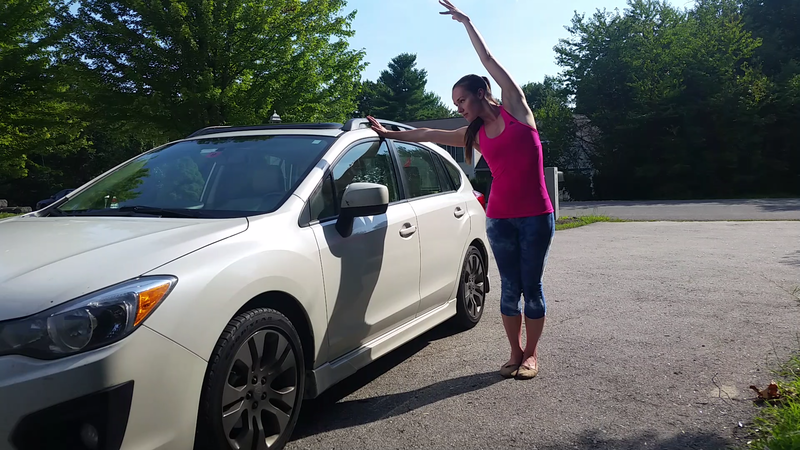 Thankfully, yoga can serve as a counterbalance to what our bodies go through as we drive. Whether we have finished our car ride or have just taken a break from driving, here are a few postures we can do once we are out of the car. With one hand on the car, lift through the opposite side of the body until the torso starts tilting in the opposite direction. We can add in the arm if we would like, letting the arm reach up, or up and over. Continue lifting through the opposite side of the ribcage (this will help give a stretch to the muscles in between our ribs as well as prevent "crunching" on the corresponding side) and take a few breaths. Repeat on the other side. It's very easy to think of forwards folds as these "toe touches" that we do with straight legs. However, such positioning can be a strain on the lower back. Instead, come into a forward fold with a deep bend in the knees and let the back relax. Stay there for a few breaths. If we'd like to straighten our legs, I recommend imagining pressing your feet so into the ground so that it feels like that sensation is what straightens the legs. This activates a slightly different set of muscles, reduces the chances of locking out the knees, and potentially gives ourselves a more stable forward fold. With our hands on our car, start walking backwards until we make some variation of an upside down letter L. Our knees can be as much bent as we need them to be. If we'd like to focus on a shoulder stretch, we can keep the knees bent and either continue walking out or let the chest sink closer to the ground. If we'd like to focus on a hamstring stretch/potential lower back release, we can keep a slight bend in the knees and think about tilting the tailbone up towards the sky (also known as an anterior tilt of the pelvis). Just like the lateral stretches, think in terms of upwards movement. Lift through the chest. If it is comfortable, the hands can clasp behind the back (hooking the thumb together is a great alternative). From there, find the stretch that works for you. For some, it means letting the hands travel behind us. For others, it means bending the elbows out to the sides or pressing the palms closer together. For others, it means not moving at all and simply breathing. Starting with our backs to our car, position our hands behind us. If we feel stable, we can walk our feet out slightly, press through the hands, and lift our hips & chest away. The head can slowly move back if that is comfortable (but be very careful not to "hinge" at the neck). Placing one hand on the car (perhaps a window) with the fingertips facing away from us, we can slowly walk away from the hand, or closer towards the car, or some variation of the two. Check in to make sure the stretch is comfortable and in line with your healthy range of motion. Shoulder range of motion differs greatly from person to person. Stay in this stretch for a few deep breaths and then repeat on the other side. 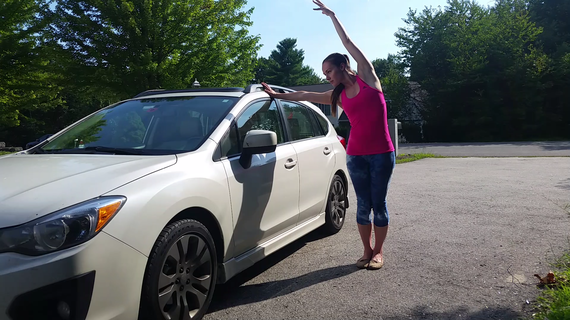 Yoga can be a great way to reverse the effects of driving, both physically and mentally. Giving ourselves even five minutes after driving to reset the body and the mind could have a dramatic impact on the rest of our day. A lot of us spend a considerable amount of time driving our cars, which can lead to achy backs, slumped shoulders, and tight leg muscles. Here are a few postures we can do while in the car to help provide a little more balance. (Please note: make sure you are not currently driving while doing these postures). To quote Tirumalai Krishnamacharya, considered the "Father of Modern Yoga": "If you can breathe, you can do yoga." Sometimes the most important yoga we can do is remember to breathe. This can help the mind, especially if we are stuck in traffic or get anxiety about driving. This can also help the body, relaxing tense muscles. Try this: On an inhale, count to the beat of 4 or 5. On an exhale, see how many beats you can count. The exhale might have the same number as the inhale's beats; the exhale might even have more. Repeat this, adjusting the number of beats according to what feels comfortable. Yoga is not just about stretching; yoga is also about movement. On an inhale, we can roll the shoulders up towards our ears. On an exhale, we can roll the shoulders down in the opposite direction. We can repeat this for as many times as we need. Pause and reverse the direction of the shrugs. This can be done with the hands still on the steering wheel, the hands by our sides, or even with our elbows out to the side (if there is room). On an exhale, let one ear fall over towards its corresponding shoulder. Please note that this isn't about getting the ear to touch the shoulder; simply, we are finding a stretch along the side of the neck. If we'd like to add on, we can take the hand on the side we've tilted the head and bring it to the opposite shoulder. Stay here for a few breaths. Come out slowly, return some movement into the neck, and try it on the other side. Since there isn't a lot of space in our cars, this particular side bend focuses more on upwards (as opposed to sideways) motion. While sitting, imagine one side of the ribcage lifting up so much that we naturally start tilting in the opposite direction. Be careful not to essentially crank the body into a sideways fold. Hold for one or two breaths and then try on the other side. When driving, it is very easy to slouch the body and hang the head forward. This exercise might help counterbalance that movement. With the hands behind our head, gently pressed the head back into the hands, and the hands into the head. This is a very subtle move. It might even feel like our head/hands don't move at all. Do this for a few breaths and then take a breath. Move the neck, or perhaps do some neck stretches. With the hands still behind the head, take in a deep inhale. On an exhale, twist towards the center of the car. Inhale back, and exhale to towards the door. Repeat as many times as it feels comfortable. With these twists, think about the exhale being the main catalyst for the twist, and the inhale being the main catalyst for returning to center. This is not about contorting the spine; this is about gently relaxing or torso muscles. Start with the Bear Hug: cross your arms in front of you until one elbow is on top of the other. Then, bend at the elbows and bring opposite hand to shoulder. If we feel we have further to go, we can lift through the chest and perhaps let the elbows lift as well. Depending on what is comfortable for the rotation in our shoulders, we can then go to Eagle Arms: let go of your shoulders and see if it would be comfortable to bring the back of the hands to touch. If it is comfortable, the forearms can continue wrapping until the palms touch. Yoga can be the exact tool we need to find a little more mental and physical resilience, both on the mat and off. Something to keep in mind the next time we're stuck in gridlocked traffic!